Elsa and Anna love sliding around and playing in the snow together, especially when Olaf joins in the fun! This Snow Sisters playset is inspired by the scene in the movie where Elsa and Anna as kids make Olaf for the first time! The Anna and Elsa dolls wear their movie-inspired pajamas each with removable bodices, peplums, and skirts. Olaf, Snap-in outfit accessories, and a snow slide are also included for seemingly endless frosty fun! The Snow Sisters Set comes in a carrying case, so your little dreamer can take the fun with her where she goes! Little dreamers will have so much fun creating Elsa and Anna's outfits and accessorizing them with the included Snap-ins. 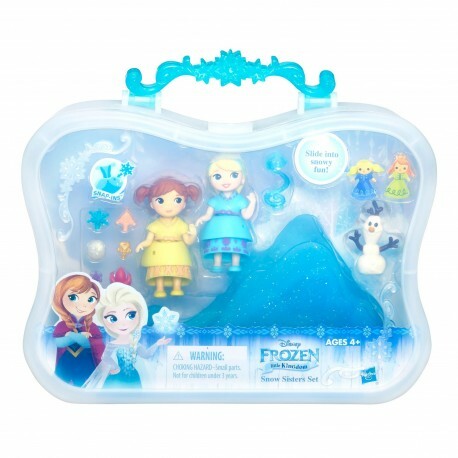 They can also decorate their Frozen characters with mix-and-match Snap-ins and outfits (additional Snap-ins and removable outfits are included with other Little Kingdom dolls, sold separately). Includes 2 dolls, 2 outfits, 6 Snap-ins pieces, figure, slide, accessory, and carrying case.